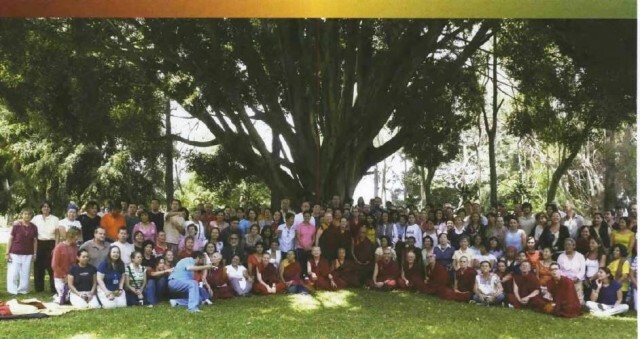 In April, the Mexican Buddhist community enjoyed a very special Dharma Festival, which included a retreat with Lama Zopa Rinpoche. Mandala presents this joyous event with a true Mexican flavour! Rinpoche, who thought they were special Mexican flowers, until Lobsang Tonden explained how to cook and eat them. monastery just outside Guadalajara. On arrival, Rinpoche was greeted by an eleven-piece mariachi band. Its members were so happy to receive his blessings, and they enthusiastically played Mexican songs outside his window for a long time. Rinpoche asked if they were part of the monastery, and if the women in the mariachi band were nuns wearing local robes. Ven. Paloma skilfully translated Rinpoche’s English into Spanish, and reviews and meditations were led by Ven.